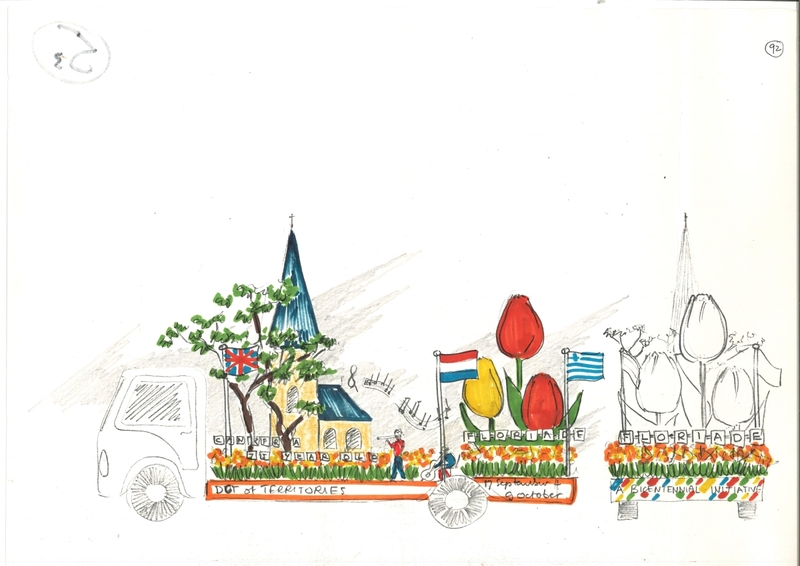 Here at ArchivesACT we find ourselves a little happier and a little heavier after another month of celebrating our wonderful hometown. From sampling new flavours at the Multicultural Festival to feasting our eyes at Enlighten and waking up in the morning with balloons floating above our backyards, Canberra certainly knows how to throw a party. 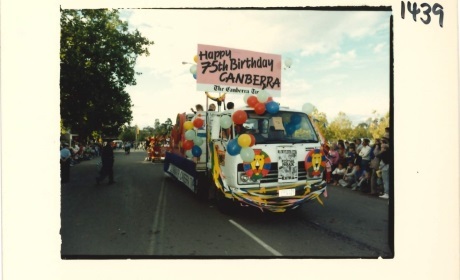 Flashback several decades, and arguably the most anticipated activity on Canberra Day was an epic street procession. 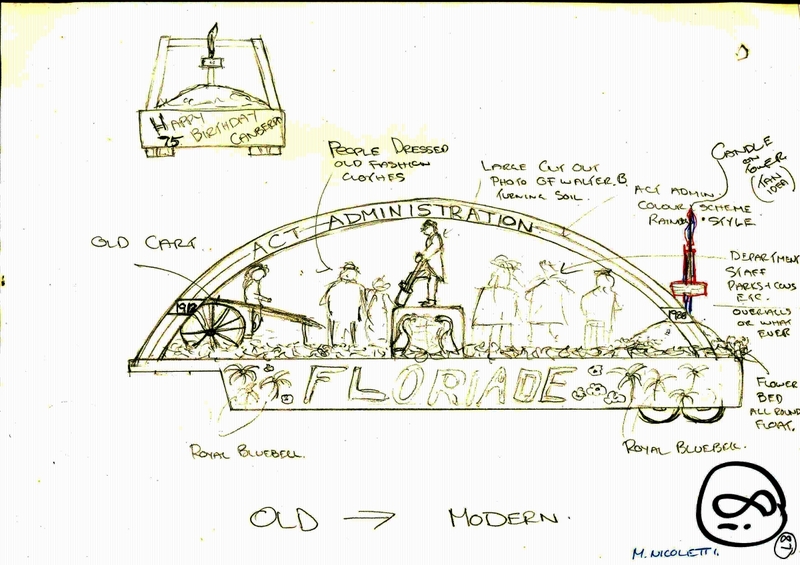 Community groups, local businesses and government employees spent months working in secret to build the perfect float in hopes of winning the coveted prize of ‘Grand Champion’. 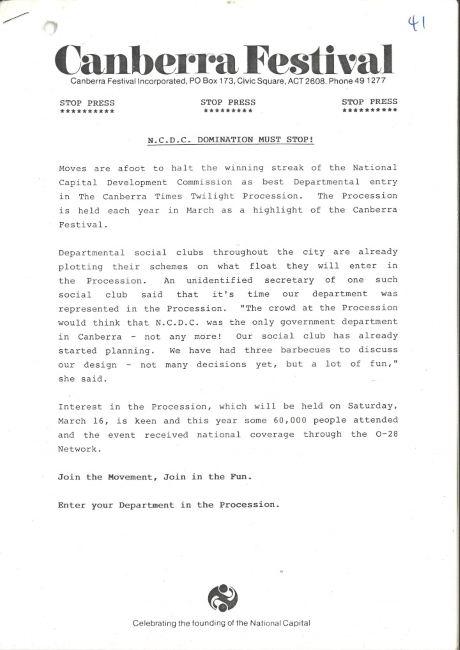 The winner of many of these processions was the National Capital Development Commission (NCDC). With a decent budget and their own army of minions in the form of government apprentices, these heavyweights won the coveted title 13 years in a row. 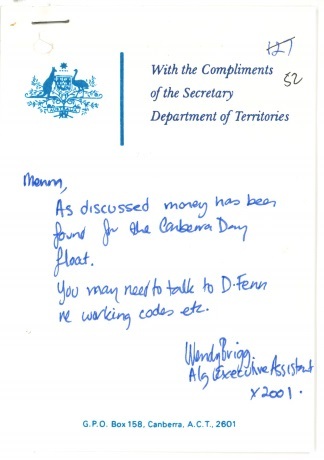 The Department of Territories, who declined the opportunity to participate due to the substantial costs involved may nevertheless have watched in frustration from the sidelines. 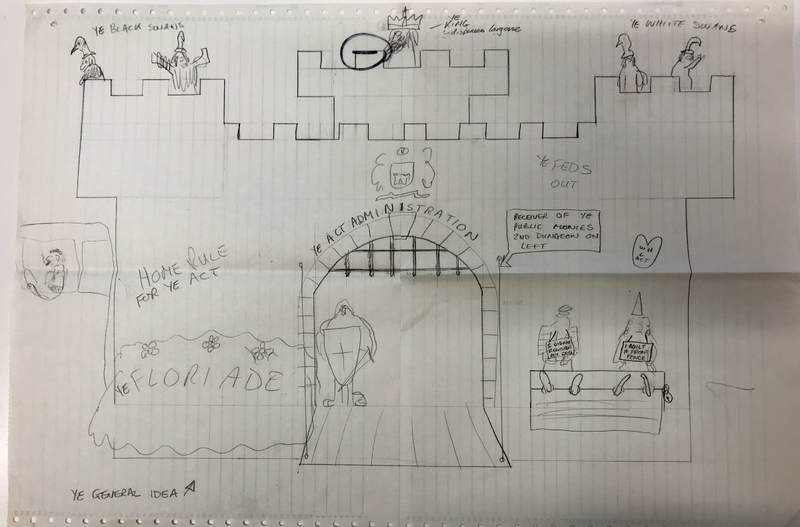 However, in 1986 the Department’s position changed, and a plan was hatched, designs were promoted, and an elite team of float building ninjas got together in a workshop in their own time to build a float to try and take down the competition. 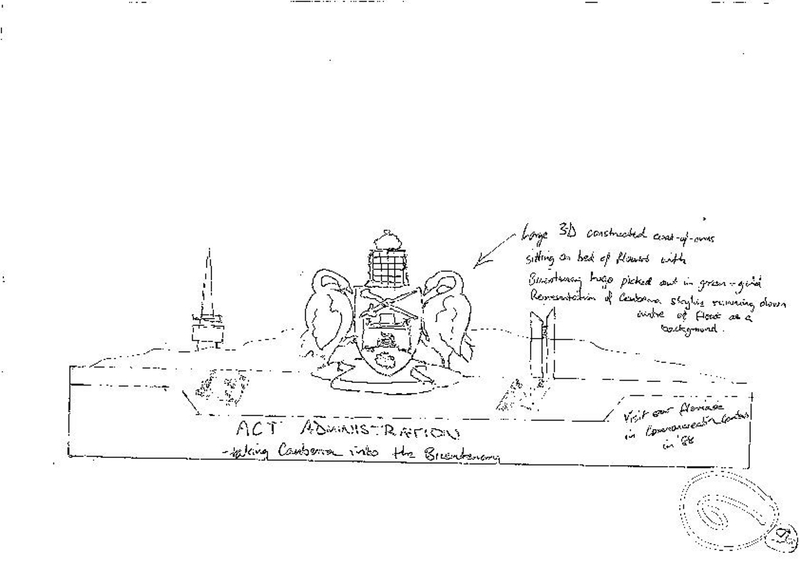 The Department of Territories undertook the administration of the ACT until 1987, while the NCDC was responsible for planning the national capital. 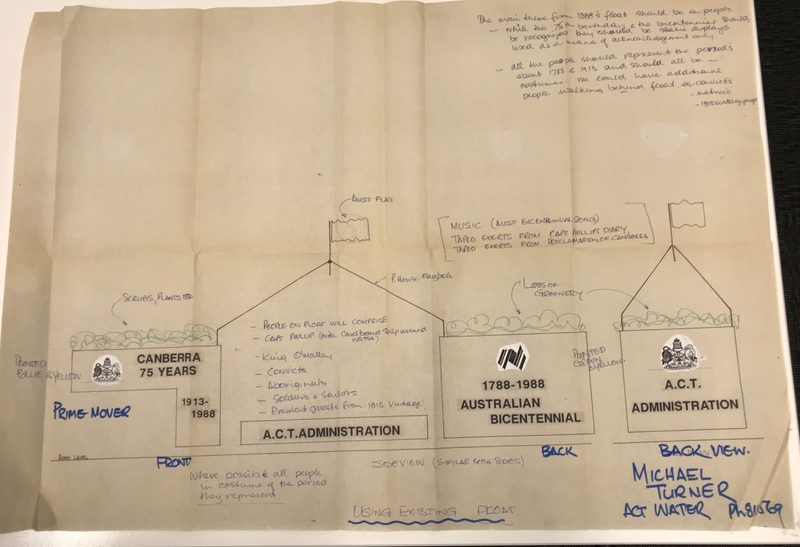 Together they were the forerunners to the ACT Government Service, and for this reason the records of their Canberra Day competition are ArchivesACT’s April Find of the Month. 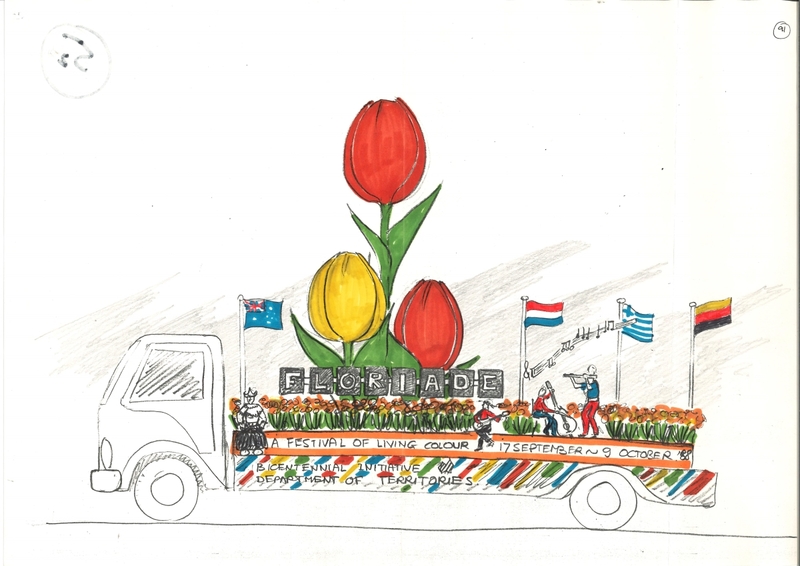 The Canberra Day Procession was one of the highlights of the annual Canberra Festival, offering Canberrans an opportunity to both learn about and celebrate the organisations that formed part of their community. It was sponsored for many years by the Canberra Times and organized by the Canberra Festival Committee. 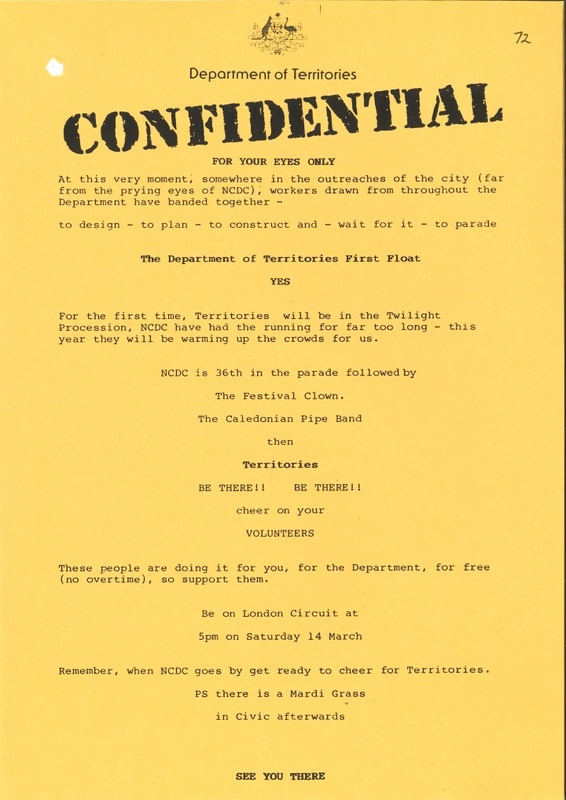 In 1986 the organisers provided a helpful float building guide and actively encouraged participation by government departments, suggesting that the procession could offer them a chance to be seen in a ‘less formal manner’. Entry in the procession was relatively cheap at $20 for non-profit and $40 for commercial entrants. Procession entrants were given an official banner which was carried before each entry by local scouts or Duke of Edinburgh awardees. 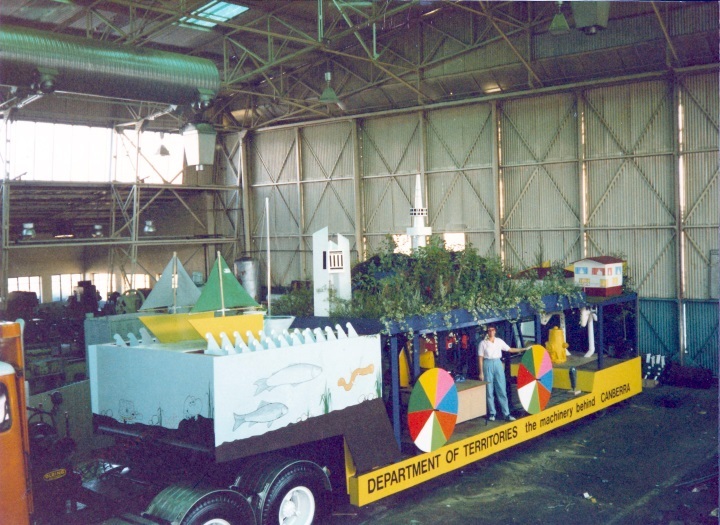 Several conditions were set including height, weight, requirements for vehicle safety standards, and giving organisers the right to remove inappropriate or offensive material. 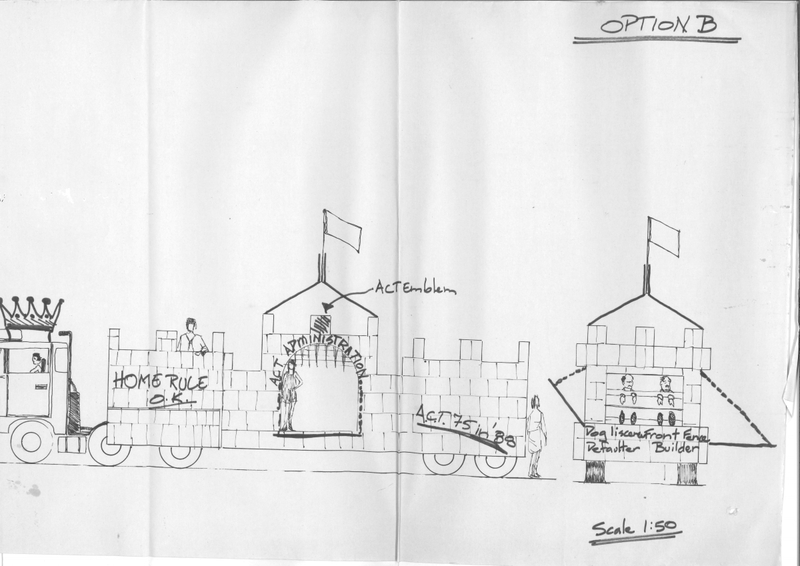 There were five categories of entries including float, decorated vehicle, marching or pedestrian unit, entry with animals, and bands. 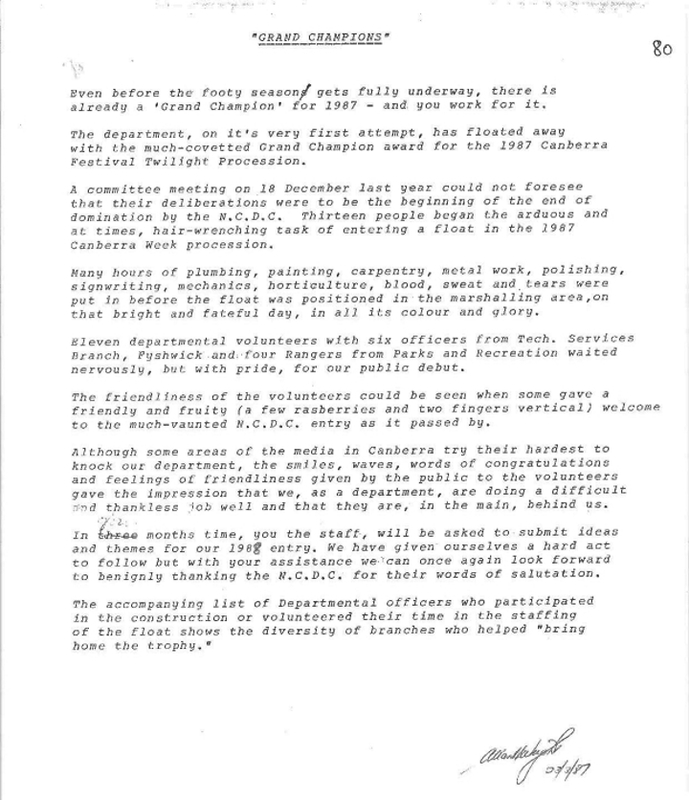 Awards were given to the most outstanding entrants under headings including best first-time entrant, commercial, departmental and grand champion. 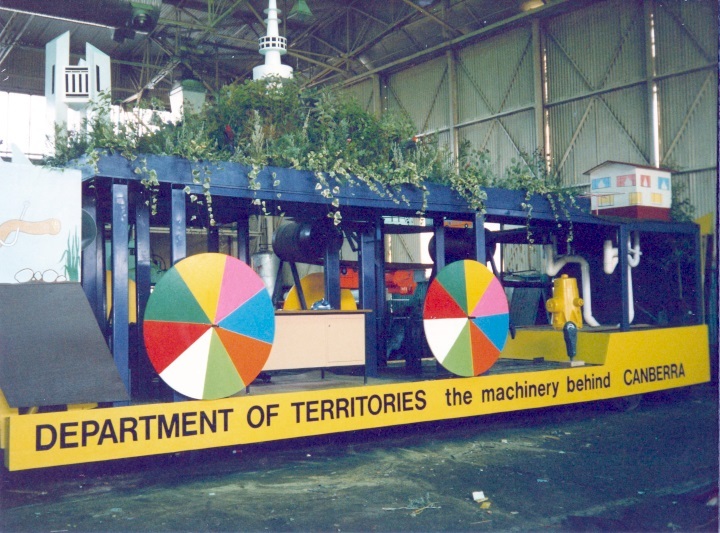 The float was constructed in a Technical Services depot, and although it was originally proposed that an outside designer be engaged, our records suggest that the design ended up being produced in-house by members of the promotions team. 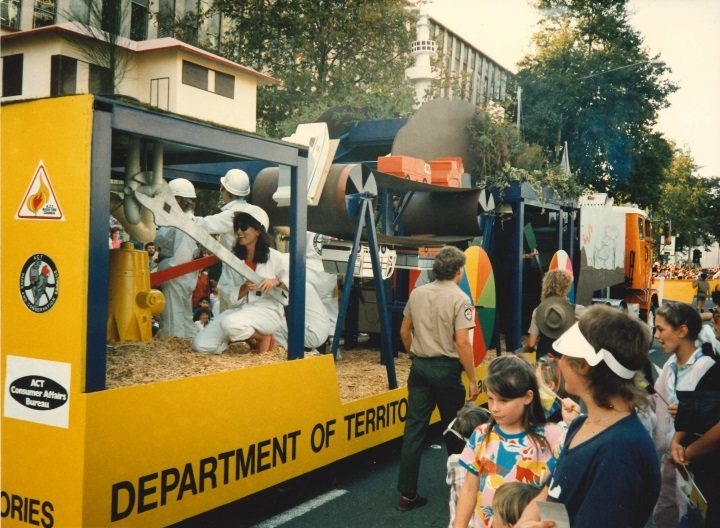 The following photos of the float in storage clearly show the top elements of the float, and the third shows the concept come to life in the procession, staffed by volunteers and accompanied by ACT rangers. Procession entry 39, the Department of Territories was an outstanding success! 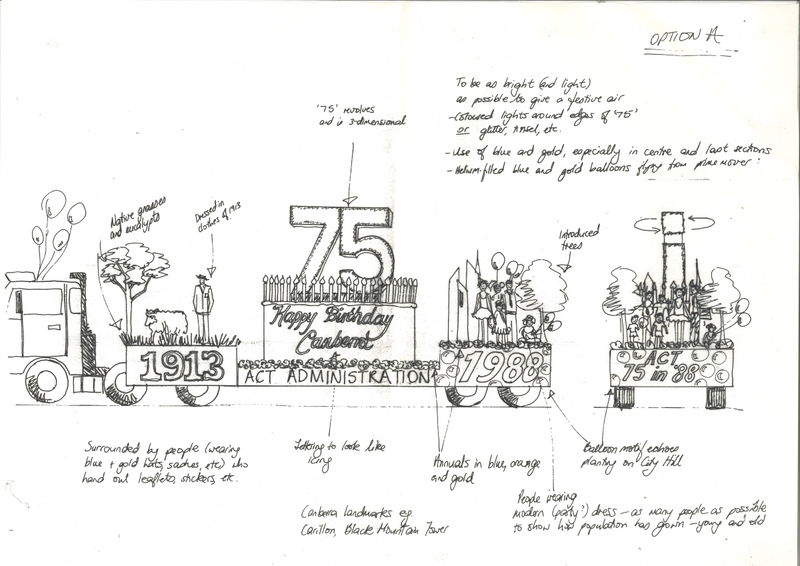 Thanks to the generosity of the volunteers and their months of hard work, collaboration, ingenuity and enthusiasm, the float was awarded ‘Grand Champion’ of the Canberra Times 1987 Canberra Festival Twilight Procession and thus ended the NCDC’s 13-year winning streak. Were you part of the winning team? Were you part of the competition? 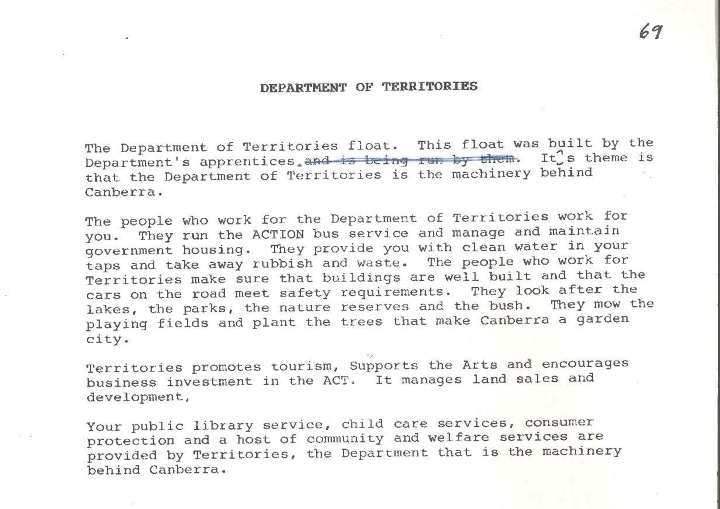 Drop us a line at archives@act.gov.au or tweet a photo and don’t forget to include @ArchivesACT.